Back on January 20th I mentioned the birth of a couple new sources of local news soon to be available to us here in the Newport-Mesa. The first, which I linked at that time, was the O.C. NOW site. You'll find the link over on the right side of this page. NOW "ORANGE COUNTY LOCAL NEWS NETWORK"
The second new source is the Orange County Local News Network, (OCLNN), which launched yesterday, February 1st. This organization, part of the broader United States Local News Network (USLNN), is the third such site under that umbrella. The others cover San Diego and Southwest Riverside. They are domiciled in the same Sunflower Street building that houses the staff of the Daily Pilot and, it is my understanding, that they will cross-post stories with the Pilot. This is good news, since the diminished staff of the Pilot has had trouble covering all the bases in recent months. They will also include stories from the Associated Press and City News Service, which gives them significant breadth of reporting. I've included a link to this new source immediately under the O.C. NOW site over on the right. If you want to read the introductory essay, "Hello, Orange County!" by Managing Editor Greg Magnus click HERE. Welcome to the OCLNN. We hope it becomes a reliable, accurate and timely source of news for us all. We here at A Bubbling Cauldron wish them all the best. Do I understand you right that the LATimes org now has the Daily Pilot, the Daily Pilot website, OC Now and OCLNN? Yet the Pilot staff can't cover the community reliably by themselves? How is four outlets with three distinct web presences more efficient than the DP organization? Maybe I am just missing something here. 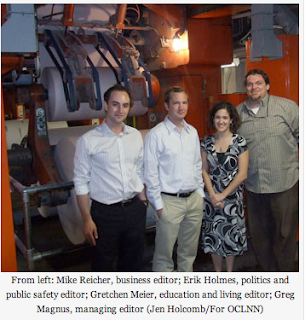 I don't believe the OCLNN is part of the Times organization, even though they share some surplus space on Sunflower. Quite simply, the DP staff is less than half of what it was before the Sam Zell era began a couple years ago. Fewer reporters, editors, photographers - you name it. Right now they have no Managing Editor - Dan Evans splits his time between the DP 3 and those others up in Burbank/Glendale/La Crescenta... impossible to cover. Add to that the inexperience and virtually no institutional knowledge left and it's hard to cover this area. No excuses for them, just cold, hard facts. So, you and I plus the other "citizen journalists" around here will just have to work harder to provide insight on local events. Strange name. I assume a Google Alert coughed up this post... don't know where you got the ABC. Regardless, you sound suspiciously like an insider to me. Yes, there are a lot of new bylines in the Pilot these days, some of which end up at the OC NOW blog and also on the OCLNN site, as well. Cross posting is a great idea, as I said earlier. Your reference to the "quality" of the current reporters is a not-very-subtle backhand at folks who have been there recently... not a classy comment. Time will tell about the "quality", don't you think? I want the Daily Pilot to succeed, as I've said many times. If joining forces with new online entities gives them momentum toward that end, then I'm all for it. I'm getting tired of trying to wade through all the ads to find content. Last Saturday, for example, more than 2/3 of the paper was advertising. I know the ads pay the bills, but it's obvious that the advertising folks are running the show these days. Perhaps they should consider charging a subscription for the print version - I'd pay for it. Stop The Fairgrounds Sale - Let's Roll! Battle To Quash Fairgrounds Sale Dead?